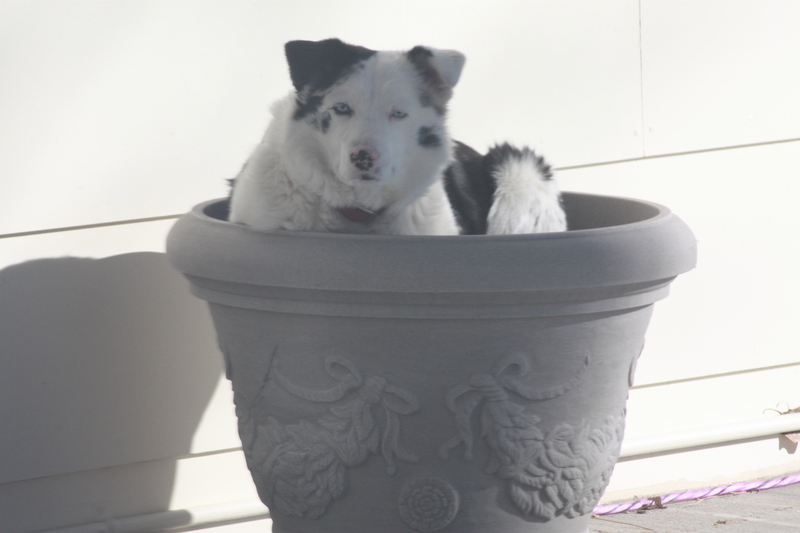 Rosie crawled up into the flower pot on the porch recently to catch some rays and take a break. She doesn’t like to be photographed, but she didn’t seem to notice the camera pointed at her through the window. She is a constant companion and believes it is her job to take care of the people who live here. She watches the doors and windows to detect any movement inside the house that might mean “we’re going for a walk,” or “they’re coming to feed me,” or “it’s time to do chores.” She is a border collie- Australian shepherd mix, and is an obsessive/compulsive herder who makes it her job to nip at any person or creature who tries to come between us. The first time I saw Rosie, I was smitten. She reminded me immediately of a dear old friend, a paint mare that was my childhood companion. She has the black and white markings, as well as blue eyes, that Pintopaint had. I guess you could say we bonded immediately. She was the last of a litter of pups to be claimed, presumably due to her pink nose and right eye that did not meet breeder standards. And her poor pink nose sunburns and peels in the summer. I asked the local veterinarian what I might do to protect her nose, and his response was “get her tatooed!” I don’t believe he was serious, just letting me know my options are limited. Rosie’s best pal is Lady, our ancient black labrador retriever who tolerates Rosie’s jealousy and herding insticts fairly well. Between them, they patrol the outer reaches of the yard and alert us to any varmints that approach the guinea house or goose quarters. Lady has a fierce bark and terrified the Schwann man so completely that he vowed he was never coming back. He hasn’t to date. The UPS and Federal Express drivers bring treats and have figured out how to get in the gate without being assaulted. As fearless as she is, Rosie has learned to never tangle with a deer. She barks and holds her ground, and if someone comes out to assist her and give her courage, she’ll give chase. Otherwise, the deer have the upper hand. Between their horns and hooves, they are formidable pugilists, standing on their hind legs and striking with their front feet. The other critter Rosie won’t tangle with (again) is a porcupine. When she was quite young, she and Lady went after a porky. Lady had the good sense to bark and raise a ruckus, but not to get close. Rosie lunged at it and drew back a face full of quills. The local vet loved getting that call at 8:00 p.m. on a Sunday evening. This entry was posted in Wildlife blog and tagged paint mare by bygeorge. Bookmark the permalink.